Naw-Ruz; the Persian and Baha’i New year is Spent in Prison!! Naw-Ruz is the beginning of the Baha’i New Year and celebrated by all Baha’is around the globe with joy and fellowship. The Baha’is of Iran feel a cloud spread over their Naw-Ruz celebration as many of their Baha’i friends and family members are spending their Naw-Ruz in the dark corners of Islamic Republic Regime prisons year after year. Vernal Equinox in Northern Hemisphere is marked as the beginning of the calendar year in two major solar calendars of the world. One calendar is the Jalali calendar which is regarded by countries such as Iran as their national calendar. According to Jalai calendar, the 365 days 5 hours, 48 minutes and 46 second solar year is divided into 12 months with months of 30 days in spring and summer, months of 31 days in fall and winter and the last month of the year called Esfand, is only 29 days. As we know the solar year to be exact is 365 days, five hours, 48 minutes and 56 seconds which is very difficult to be divided into any numbers to keep the calendar stable and safe from fluctuation. This is specially important for any sort of record keeping including scientific data. The new year in Jalai calendar is designated as the vernal Equinox, the first day of spring which is called in Persian Naw-Ruz meaning the new day. At present according to Gregorian calendar we are in March 20, 2014 and in Jalali calendar 29 of Esfand in the year 1392 . Iranians all over the world celebrate Naw-Ruz with all the joy and preparation that comes with the coming of spring. The video bellow by one of the celebrated Iranian folk music groups Rastan is a beautiful assortment of different ethnic groups celebrating Naw-Ruz in their local music. The Baha’i Calendar is considered to be the most accurate and stable solar calendar dividing the solar year into 19 months of 19 days each, which makes 361 days and the remaining numbers is placed between the last month Ola and the month before it. These 4 extra days and in leap years 5 days are called Intercalary days or Ayyam-I-Ha (days of five) and time for celebration, gift giving, fellowship and good will. The names of the months in Badi Calendar are attributes of God such as Splendor, Glory, Beauty, Grandeur, Etc. 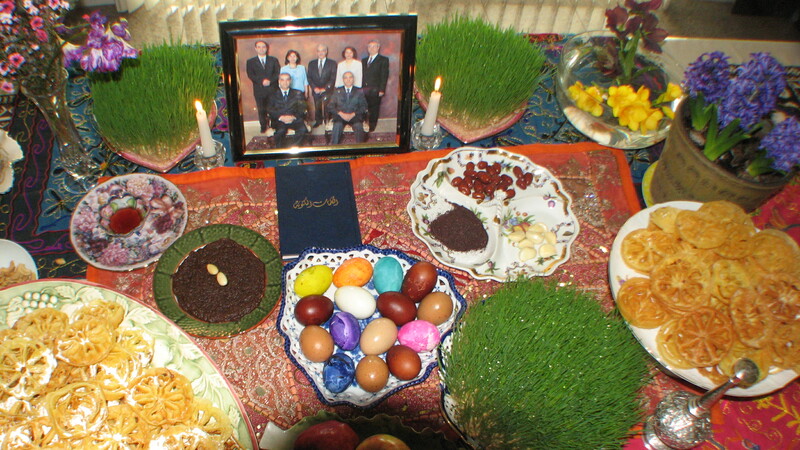 Baha’is from all over the world from many ethnic and religious background celebrate Naw-Ruz as their New Year with great joy after finishing a 19 days of fast. Naw-Ruz is specially a time of joy for Baha’is of Iran who have been celebrating the dawn of the new day from the inception of Baha’i Faith in 1844 and are delighted that Naw-Ruz has been celebrated by all Iranians for centuries and with deep cultural roots. The whole country takes a new and nostalgic look and sounds and smells of the new year and beauty of spring is budding in every branch, every flower and every heart. Since the beginning of the Islamic Republic Regime of Iran and systematic persecution, killings and imprisonment of the Baha’is of Iran and banning of the Baha’i students from attending university, Naw-Ruz has become a bitter sweet time of the year. Several hundred Baha’is are spending their Naw-Ruz in prisons of Islamic Republic Regime away from the embrace of their families and friends. We like to specially remember them in our hearts and prayers. The video bellow brings into mind the faces of these shining examples of resilience, peace, love for humanity, oneness of all humanity, justice, freedom for all, and harmony of religion and science to be brief. I like to remember this Naw-Ruz with the special message and greetings of Naw-Ruz to the Baha’is of Iran from the Universal House of Justice, international governing counsil of the Baha’is of the world. تحیّات خالصانه و تبریکات صمیمانهء خود را به مناسبت فرارسیدن نوروز فیروز و آغاز بهار دل‌افروز به یکایک شما خواهران و برادران عزیز روحانی و به کلّیّهء مردم شریف ایران تقدیم می‌داریم. اخبار خوش استقبال پرشور جوانان برومند آن سرزمین از پیام مورّخ ۹بهمن ۱۳۹۲این جمع و پویایی جامعهء اسم اعظم در مهد امر الله موجب نهایت سرور و حبور این مشتاقان گردید. در آستانهء سال نو دست شکرانه به درگاه خداوند بی‌مانند بلند می‌نماییم که الحمد لله شما دل‌دادگان روی جانان علی‌رغم ظلم و ستم فراوان و محدودیّت‌های بی‌پایان در مسیری گام برمی‌دارید که آرزوی حضرت عبدالبهاء برای احبّای عزیز ایران بود: “…جمیع شب و روز به آنچه سبب عزّت ابدیّهٴ ایرانست پردازند و در تحسین اخلاق و آداب و بذل همّت و مقاصد ارجمند و الفت و محبّت و ترقّی و اتّساع صناعت و زراعت و تجارت سعی بلیغ و جهد عظیم مبذول دارند.” در اعتاب مقدّسۀ علیا موفّقیّت بیش از پیش شما عزیزان را در میدان خدمت مسئلت می‌نماییم. This entry was posted in Baha'i Holidays, Education, Farsi, music, News, Questions, videos and tagged 19 days of Baha'i fast, Ayyam-I-Ha, Badi calendar, Baha'i Calendar, Baha'is of Iran celebrate naw-Ruz in prison, Intercalary days, jalai Calendar, Naw-Ruz, Naw-Ruz 1393 message of The Universal House of Justice, Naw-Ruz is Baha'i new year. Bookmark the permalink. One Response to Naw-Ruz; the Persian and Baha’i New year is Spent in Prison! !